If you can click a mouse and type a few paragraphs, then you have all of the skills that you need to make your own website. Years ago, the only way to create a website was to either learn tricky HTML coding or hire an expensive web designer. Thank goodness technology has come so far that nowadays, you don’t need either. Now you can build your own website in just a couple of hours with absolutely no skills whatsoever. All you need is a computer and internet access. With simply just that, you can build a website on either a free platform or on a paid one (typically around $10/month). We will show you how to do it right here. Learn how to quickly & cheaply build a professional looking website with no skills whatsoever. Discover secrets to optimize any website to show up better in online search results. See the simple strategy that turns website visitors into actual paying customers. Today's convenient & easy online tools make it simple for anyone to build a website without any skills, by using what is called a WYSIWYG editor, also known as “what you see is what you get” software. These online software editors allow you to just simply drag & drop text or photos around on the page and then publish it as a website. The best WYSIWYG editors that are available online are free and they allow a complete novice to create a professional looking website within just a couple of hours. Basically what the software does, is it allows you to point and click your mouse to add pictures and text to a page. Just like if you were working in Google Slides or Microsoft Powerpoint, but even easier. Once you have added all of the text and photos to your site, you then just click one button and the WYSIWYG software then converts your text and images into html code and publishes it to the internet as a website. It does all of that work for you in just seconds. 90% Of Pet Owners Search Online FIRST When Looking For A Groomer. Can They Find You? 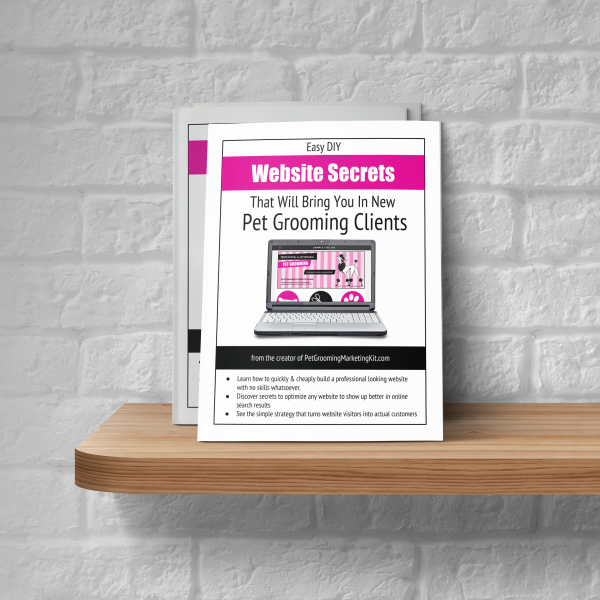 The Website Secrets booklet is included in the advanced edition of The Groomer's Profit Kit.